Seldom sought out as a rail town, the Erie region is about as good of a place as any to see some rail action. Its rail history goes back to the infancy of railroading. It was caught up in the center of the railroad track gauge fight, with an all out war happening between December 7, 1853, and February 1, 1854. From Erie to the New York border on the Erie and North East Railroad, the track gauge was 6 feet, and from the New York border through Buffalo, the track gauge was 4 ft 10, while the track laid east from Erie was 4 ft 10 as well. This twenty mile stretch caused massive delays on a critical rail corridor between Buffalo, Cleveland, and points west. The citizens of Erie enjoyed being a terminus town, having passengers and rail crews staying overnight and patronizing local businesses. Once standardization began to occur, the city council passed an ordinance allowing the mayor to call for the police to openly advocate for sabotaging the new rails, and removal of any railroad bridges that would foster the new rail gauge. The mayor would end up using that authority to have people cut out sections of a bridge that had just been built. Similar actions occurred up in North East, with them tearing up sections of rail. Eventually the squabbles would settle, and a standard gauge would eventually prevail, leading towards Erie thriving as a rail and industrial center. It soon became clear to the industry and lawmakers that a standard gauge needed to be adopted, with the Pennsylvania Railroad leading the charge, setting the standard gauge at 4 ft 9 inches, thus giving them the nickname, "the standard railroad of the world." The unrest in Erie made it clear that a prevailing standard gauge needed to be put in place, and the change would happen just over two decades later. With the first wave of rail consolidation, the railroads that crossed through Erie would become main lines for both the New York Central and the Pennsylvania Railroad. The two railroads shared a station in Erie for the length of their time in Erie, staying true to the "Union Station" name that the stations would be adorned with in Erie. The current station was built in 1927 in the Art Deco style, the first known employment of this style in a train station. At its peak, it was served by four different passenger lines, the New York Central Water Level Route that ran from New York to Chicago, the New York Central Youngstown Branch, which ran from Buffalo to Youngstown, the Pennsylvania Railroad's route over the old Philadelphia and Erie Route, which terminated in Harrisburg with connections to Philadelphia, and the Pennsylvania Railroad's routing from Erie to Pittsburgh. Amtrak still utilizes the old New York Central Water Route on its Lake Shore Limited, which runs from Chicago to Boston and New York City, via Cleveland, Erie, Buffalo, Rochester, Syracuse, and Albany, where it splits and one half is taken to Boston, and the other to New York City. Additionally, the station is home to a number of businesses, including a brewery and restaurant, named the Brewerie at Union Station, which sits in the original main passenger area of the old station. Nowadays, the city serves Norfolk Southern, CSX, and Canadian Pacific Railroad lines, and is a hopping place to see all kinds of rail activity. General Electric Transportation has operated a locomotive manufacturing facility in town since 1910. Perhaps the finest gem in the region's current rail heritage is located in the borough of North East at the Lake Shore Railway Museum. The museum's collection of everything vintage rail is centered around a Lake Shore and Michigan Southern Railway and eventual New York Central Railroad station from 1899. You can even board a complete Great Northern Railroad Empire Builder sleeper and dining car. The cars are beautiful. This dining car hails from 1951 and was built by American Car and Foundry, and spent some time as an Amtrak Car. Hailing from 1950, this was built as US private passenger rail service was winding down. This set was taken out of service in 1970 and unlike similar sleeper cars from this era, it was never placed into Amtrak service, keeping this set largely in original form. The station is located along mainlines for CSX, Norfolk Southern, and Canadian Pacific Lines. Here goes a Canadian Pacific train now! Old rail meets new! Amtrak's Lake Shore Limited passes through here, if you would like to see the Empire Builder train cars alongside modern passenger train cars. Here is a 1947 Budd stainless steel coach. Budd was once based in Philadelphia and was a staple of the community for the greater part of a century. This coach is is in first generation Amtrak paint, though it began its service with New York Central and may have even passed this location when New York Central was dominant in the region. A number of cars and locomotives are in various states of preservation. Local products are a theme at the museum, for the Erie region was a hub for rail production. This is a a fireless steam engine that was built by the Heisler Locomotive Works, which was located in the Erie region, in Dunkirk, NY, and later in Erie, PA, from 1891 through World War II, when diesels finally knocked out steam. This is the Illuminating Company #6 that was built in 1937. It is one of only roughly 35 Heislers, out of over 600 that were produced, that remain in existence, and the only one that is operational. It spent its life in nearby Ashtabula, OH, working for the Cleveland Illuminating Company until 1973. The beautiful station building of the museum. It is staffed by a number of people that are ecstatic about railroading. We talked to them for a long time about railroading. The station area is filled with artifacts and a gift shop, sure to excite anyone into railroading. Artifacts from most major railroads are on display. A display of a Pennsylvania Railroad signal, showing what the certain light patterns mean, which inform trains of what lies ahead on the rails. Just some preserved schedules from a few of my favorite railroads. And some beautiful locomotive plates! I especially love that B&O plate, which must have been awesome to see in action. Here is New York Central 2500. It was built at the nearby Erie GE Locomotive Works in 1963 and is one of only two known NYC units to survive. It operated under New York Central, the merged Penn Central, and Conrail, where it was eventually retired in 1982. GE painted this unit back into its original New York Central paint in 1993. I naturally had to step into the cab. Here is the former Norfolk Southern GE B32-8 #3563. This GE locomotive was built in Erie in 1989 and is the first of its kind to be preserved in a museum. It is great to see that this museum is preserving historic diesel trains, which are often overlooked. They have been in the process of getting a new locomotive, a classic GE in vintage Chessie System paint, that will greatly complement their collection. While the locomotive had not arrived yet, it was in the process of coming in and I look forward to getting back to see it. This is the Wellsville, Addison, and Galton Railroad locomotive, which was built in 1940 by Erie's General Electric. It was designed to resemble a 1937 Ford automobile and it was originally built for the Ford Motor Company. Only eight of this design were built and this unit is the only one that remains. This caboose has local origins, having been built in 1916 by the old Russell Snowplow Company in Ridgway, Elk County, just over two hours from the Erie area. It was built for the Pittsburg & Shawmut Railroad. Here is a former Penn Central transfer caboose that continued on to service Conrail. Here is the museum's only baggage car, and it served with the Chicago, Burlington, and Quincy Railroad. Here is "Little Joe," an electric locomotive that was built in 1949 in Erie on an order for Soviet Railways, but due to the ramping up the Cold War, the order was never delivered. 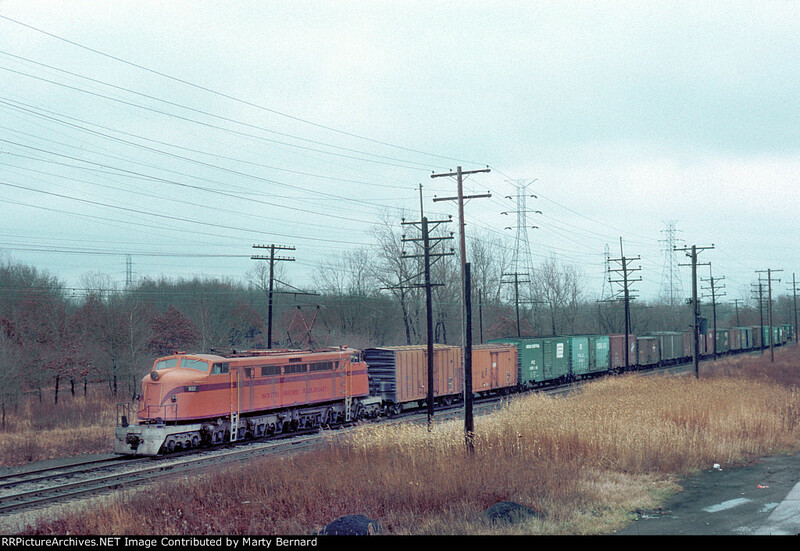 This locomotive ended up serving the South Shore Line in Illinois. Nowadays, the bulk of refrigerated freight carried on railroads goes by way of Thermo-King equipped tractor trailers carried on rail cars, destined for intermodal centers. This rail car predates that technology. The Erie region's agricultural industry depends upon temperature controlled transportation for its crops and seeing this relevant history at the museum is pretty neat. The museum has a series of beautiful Pullman sleeper cars in addition to the pristine cars that operated on the famed Empire Builder route. These cars include New York Central sleeper cars that are in the process of being restored. Here is the Central Park Pullman car that was built in 1925 and is the last known Pullman/New York Central sleeper/observation car in this configuration. It is said to have carried the New York Yankees after one of their World Series victories. While I could find no verification of this, stories like this create a connection and further illuminate your imagination. These elegant sleeper and observation cars are awesome. Here comes a modern CSX train, being lead by CSX 3388. There was track work on the day that we visited on both the CSX and Norfolk Southern Rails, making trains passing through unusually sporadic on these critical main lines. The double decker CSX load, meeting the museum's beautiful Great Northern Railroad's Empire Builder sleeper and dining cars. Right after the CSX train pulled through, this Norfolk Southern train, locomotive NS 9577 really flew, teamed with a Union Pacific locomotive 8822. This was one seriously fast freight train, moving a good deal faster than the CSX and CP trains that flew through earlier. As you can see, this is an excellent spot to watch trains. The platforms for this old New York Central station are excellent for watching trains. You definitely need to check out the railroading scene in the Erie Region. The Lake Shore Railway Historical Society Museum is top notch, filled with awesome old rolling stock and a world class train observation area. In my time there, I ran into train aficionados from Montana, Texas, and Michigan who had gone out of their way to watch the trains in the area and to see the collection at this museum. Additionally, the curators of the museum are very nice and a pleasure to talk with.